Michelle decided to brighten up the school premises by attaching various posters to doors around the place. In the interests of modesty, Miss Liversausage's picture now sports a large sunflower to cover her embarrassment. 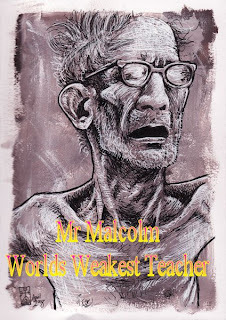 As for the picture of Mr Malcolm, Michelle's assertion, "Mr Malcolm, World's Weakest Teacher" does have a touch of irony about it. 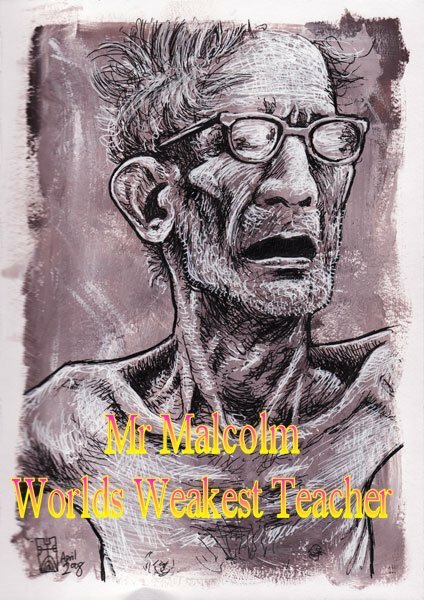 Mr Malcolm is indeed a practised wielder of implements, (and I think a lot of the practice was performed on my nether regions) and one of the fiercest teachers I know! I only have to glimpse him removing his smoked dragon from the implement bag and I find myself pleading for leniency. He's a tad deaf too.....!